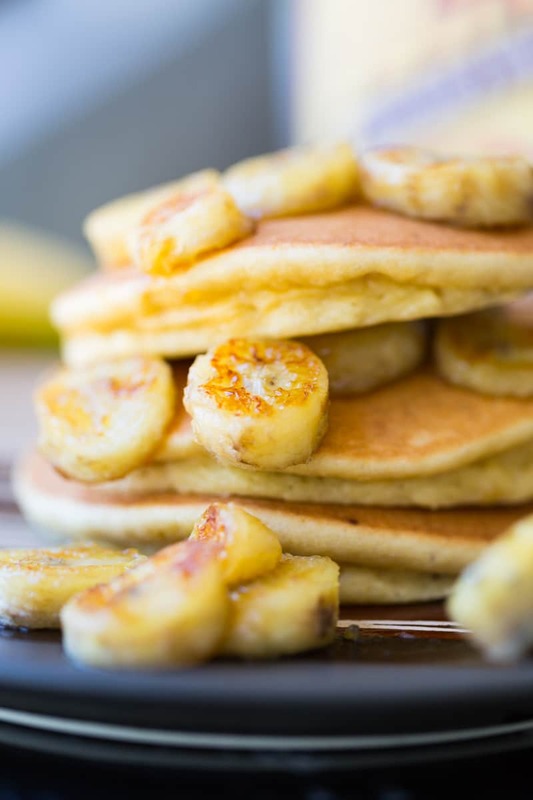 Fluffy paleo pancakes made with Bob’s Red Mill Paleo Pancake & Waffle Mix and topped with sweet caramelized bananas. Paleo never tasted so good! Pancakes are can seem like an indulgent breakfast. But what if I told you that there’s a way to amp up the protein and nutrition in your morning flapjacks, and make them incredibly fluffy? Oh, yes, now I’ve got your attention! Or something to that extent. I’m not usually prone to using “heck” in emails, but I may have gotten carried away with excitement. I was most excited to try out their new Paleo Pancake & Waffle Mix, but when I looked inside the box, I also saw a few extra treats. More on those a little later. The Paleo Pancake & Waffle Mix is lightly sweetened with coconut sugar, but since I’m a sucker for sweetness, I decided to amp it up (healthfully) with a few caramelized banana slices using a bit of maple syrup and coconut oil. Plus, I’ve included a special technique for making your paleo pancakes fluffy. 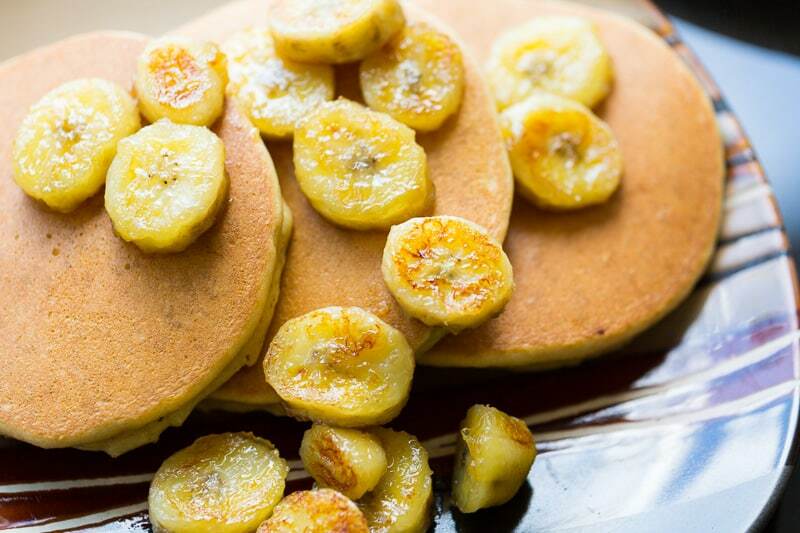 The trick to making fluffy paleo pancakes involves treating them like a cake. You’ll use whipped egg whites to lighten the batter and make it as fluffy as possible. This dish makes a great breakfast, of course, but it’s also suitable for breakfast-for-dinner, or refueling after a workout. It’s versatile and delicious. The Bob’s Red Mill Pancake & Waffle Mix can be used for pancakes, obviously, and also for waffles. For even more flexibility, you can pick up their Paleo Baking Flour. Use the Paleo Baking Flour for everything from muffins and cookies, to flatbreads and cakes, and more. If you like smoothies, you’ll really like their Vanilla Protein Powder Nutritional Booster. It’s gluten free, sweetened with monk fruit, and includes chia and probiotics. It also comes in chocolate, chai, and unflavored. 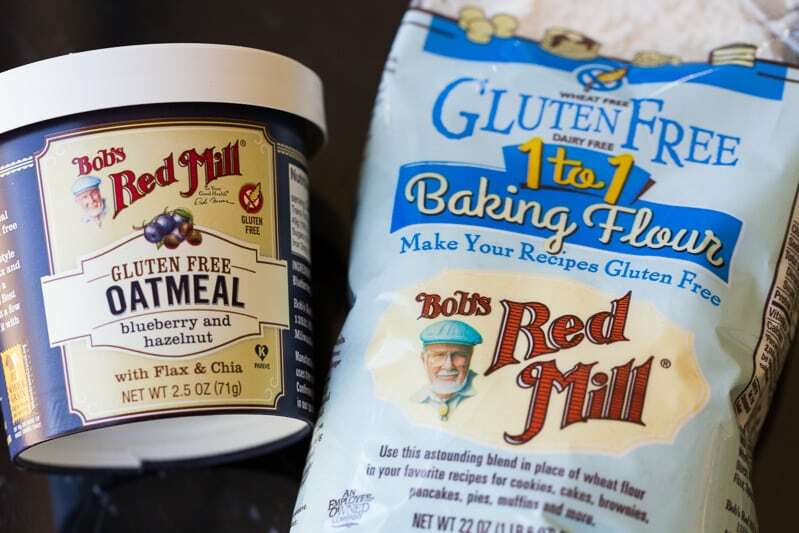 Those who dig gluten free products will love their Gluten Free 1-to-1 Baking Flour. 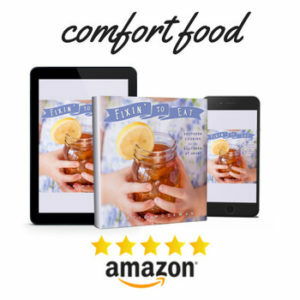 Use it cup for cup as a substitute in all your favorite recipes. You can also pick up one of their Gluten Free Oatmeal cups. I tried the blueberry and hazelnut flavor, which was lovely. It makes an excellent grab-and-go breakfast on days where you don’t have time to make fluffy paleo pancakes. 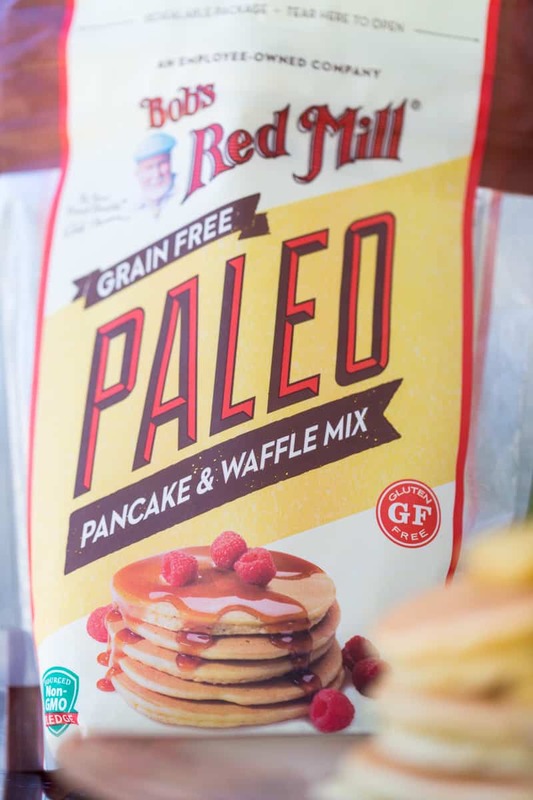 Are these paleo pancakes grain and gluten free? Yes, when made according to the directions. What makes these paleo pancakes fluffy? Separating the eggs and beating the whites into a foam, which adds more air bubbles, making the pancakes even fluffier. Do you have to make the caramelized bananas? No. If you don’t want them, just skip those ingredients and the related directions. 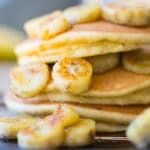 Are these really the best paleo pancakes? How do they taste? In my experience, yes. They taste like fluffy pancakes with a mildly coconut-flavored sweetness. 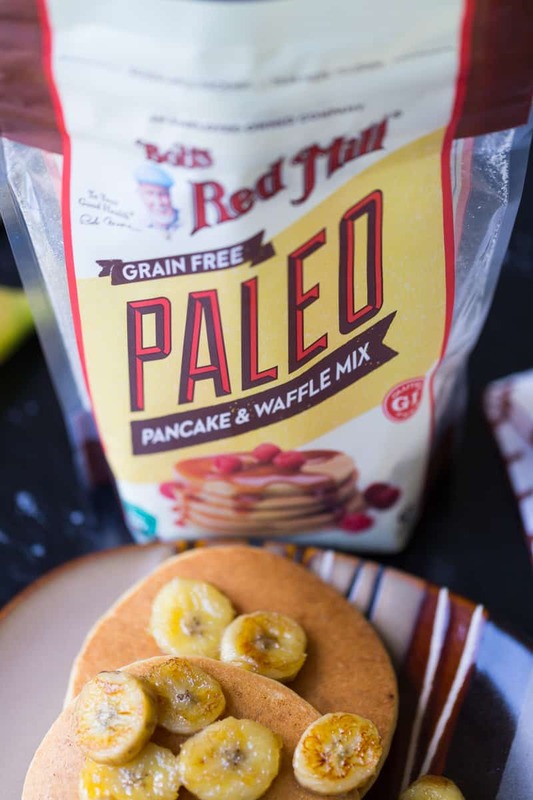 Where can I buy Bob’s Red Mill Paleo Pancake and Waffle Mix? 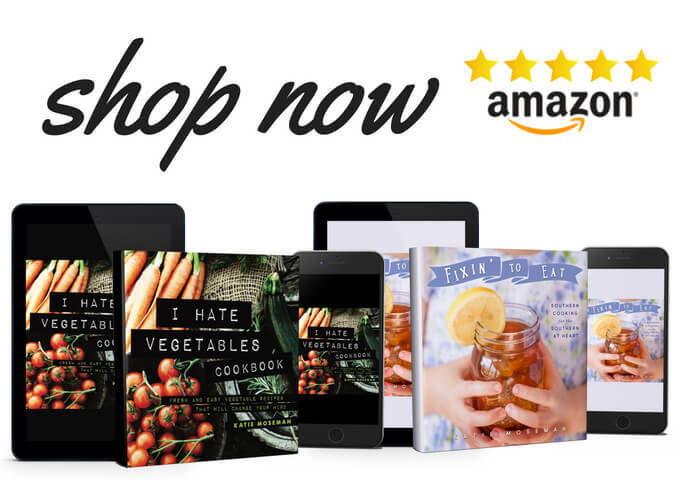 Find a store here, or shop online. 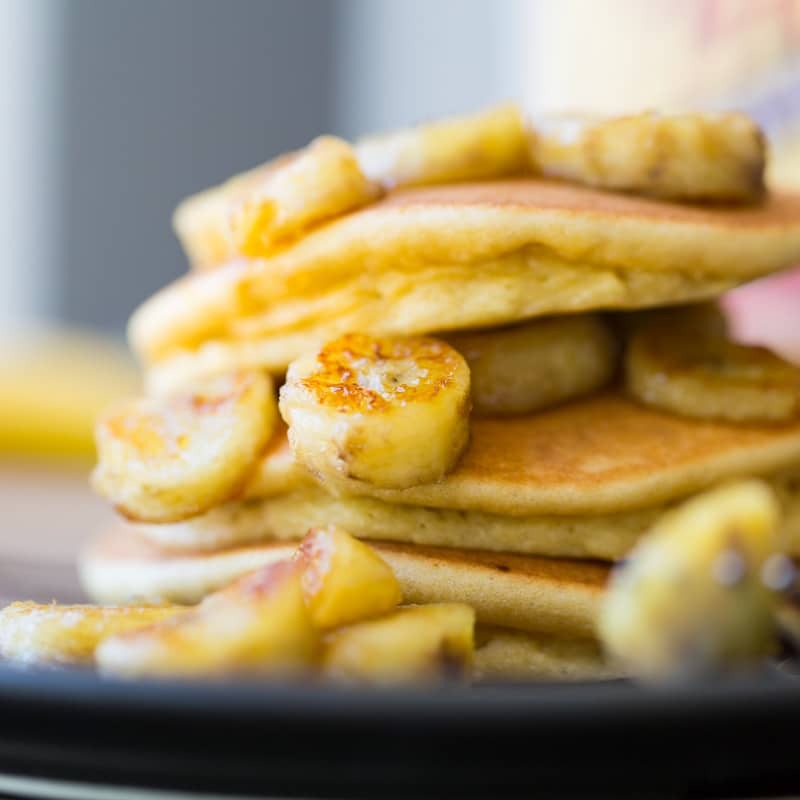 Fluffy paleo pancakes made with Bob's Red Mill Paleo Pancake & Waffle Mix and topped with sweet caramelized bananas. 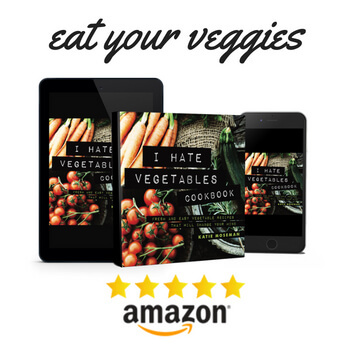 Paleo never tasted so good! Slice the banana into rounds, place in a bowl, and gently stir to coat with the maple syrup and 1 teaspoon of melted coconut oil. Set aside. Preheat a griddle or nonstick pan to medium heat. Separate the egg whites from the egg yolks. Place the egg yolks in a large mixing bowl and set aside. Beat the egg whites in a small mixing bowl until foamy but not stiff. In the large mixing bowl, add the water, melted coconut oil, and vanilla (if used) to the egg yolks. Whisk together. Add the paleo pancake mix and whisk until combined. Gently fold in the egg white foam until fully incorporated. Pour 1/4 cup of batter at a time into the preheated griddle or pan. Cook about 3 minutes, then flip and cook until golden brown. Remove to a plate and cover to keep warm. Repeat until batter is gone. 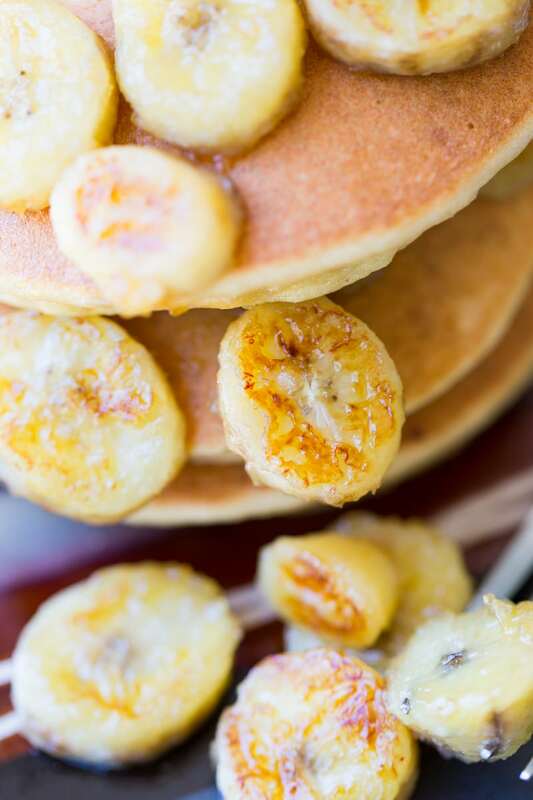 Place the banana rounds in the hot pan. Cook on one side until lightly browned, about 1 minute, then flip and cook the other side. Top the pancakes and serve immediately. You can use the batter to make waffles. Make the batter according to the instructions, then follow your waffle maker's instructions for batter quantity per waffle and cooking time. You can even caramelize bananas in your waffle maker, if you like, once the waffles are done. It can leave a sticky residue, so be prepared for a little extra cleanup. Fuel your summer! 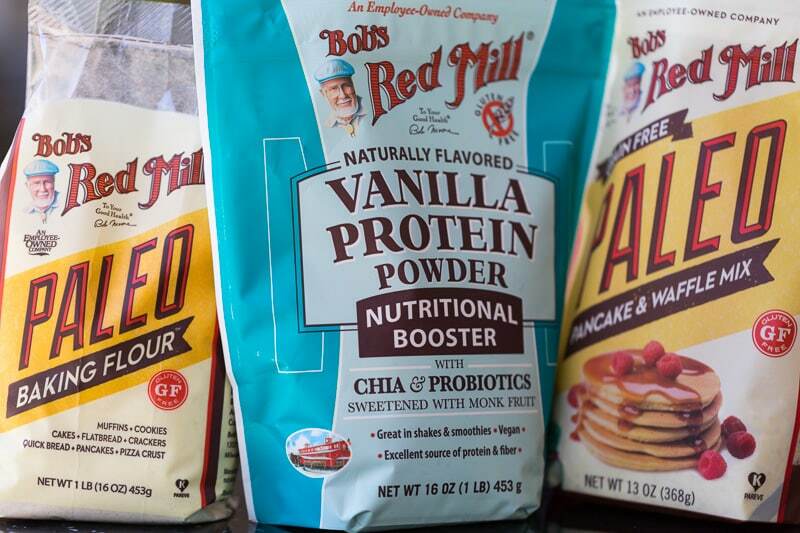 Shop for all of these fine products at Bob’s Red Mill. Also try my sorghum pancakes made with sorghum flour. That’s so great that you can make paleo pancakes.